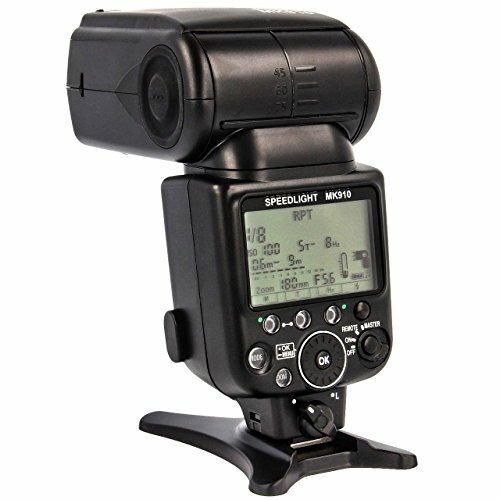 2.The MK910 can easily perform various type of flash operations,such as i-TTL auto flash and wireless multiple flash. 3.Three types of illumination patterns(standard,center-weighted and even)are availavle to match different shooting preferences. 4.Bounce flash or close-up flash photography can be easily performed. 5.Custom functions are provided to allow for various setting. Advanced wireless lighting, with advanced wireless lighting, wireless multiple flash operation in the TTL (i-TTL)mode can be accomplished with CLS-compatible digital SLRs. In this mode, you can divide the remote flash units into three groups and control the flash output independently for each group, expanding your range of creative multiple-flash shooting techniques. AF-assist illuminator, in autofocus operation, the MK910 emits AF-Assist illumination, which matches the wider AF area of CLS-compatible cameras. With cameras supporting this function, autofocus photography in dim lighting is possible even when the camera's focus point (focus area) is changed. I-TTL mode, monitor pre-flashes are fired at all times. The subject is correctly exposed by the light from the flash lighting and the exposure is less affected by ambient light.